1938 Ihagee Vest Pocket Exakta Jr.
1938 Ihagee Vest Pocket Exakta Jr. is a 127 film version of the "Kine" Exakta which was the world's first 35mm SLR camera. 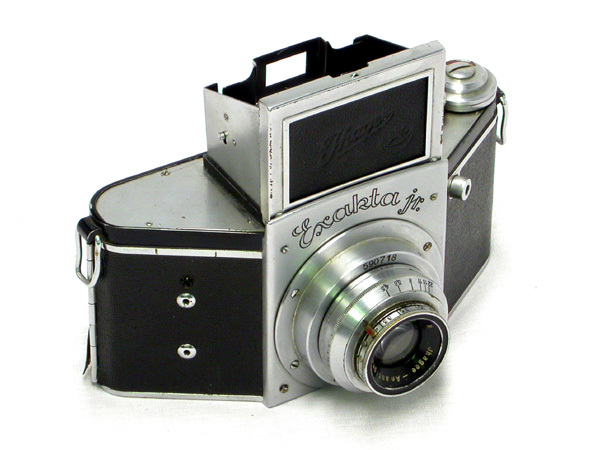 This rare chrome version (type 5.2) of the VP Exakta Junior was a cheaper alternative to the regular VP Exakta with no slow speeds and a top shutter speed of 1/500 instead of 1/1000th. It also had no provision for lens interchangeability and was fitted with a Ihagee-Anastigmat f4.5 / 7.5cm lens.